LinkedIn is a key networking tool for small businesses. In fact, there are around 396 million active users subscribed to the platform and an average user devotes around 17 minutes every month on the LinkedIn. No wonder, nowadays, most small businesses are seen in a lookout for effective LinkedIn groups to connect with small business professionals, industry insiders and experts. But since there’s a multitude of LinkedIn groups, so how do you choose the ones most valuable to you? Here, we present to you some interesting LinkedIn groups that you must follow. But before we delve any further into these 10 interesting and thought-provoking LinkedIn groups, let us remind you that joining these groups wouldn’t alone help your small business. You would need to post unique and informative content, take part in discussions, actively grow your LinkedIn network and look for creative social media page design dedicated to your LinkedIn account in order to build your brand exponentially on this fastest-growing professional networking platform. 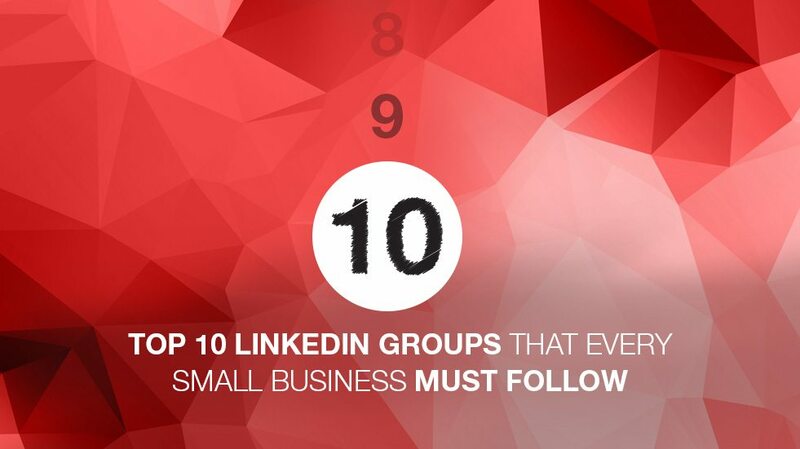 Let’s now explore the top 10 LinkedIn groups that every small business must follow. 1.Small Biz Nation – One of the most sought after groups on LinkedIn, Small Biz Nation boasts of nearly 19,500 members. Small business leaders, visionaries, strategists and experts collaborate and share ideas, industry news, latest information, and tips and tricks in this group. With its ever-thriving community of experts and leaders, this is a group worth following. 2. Social Media Marketing – Perhaps the largest and the most active group on LinkedIn, Social Media Marketing has over 825,000 members and 20 sub-groups. With active and interesting discussions and content on topics related to social media marketing, this group is sure to help you devise a perfect strategy for your small business to unleash success on the social media turf. 3. Entrepreneurs Network – With 12,967 members, Entrepreneurs Network is the perfect destination for small business owners and entrepreneurs. This group enables you to indulge in discussions with like-minded people, ask questions, get answers and broaden your horizons. 4. Innovative Marketing, PR, Sales & Social Media Innovators – With nearly 267,000 members, it is yet another interesting group that offers loads of thought-provoking information on marketing, social media, public relations, brand promotions and brand positioning. By simply participating in discussions and heeding the best practices, ideas, advice & solutions shared in this group, you can steer your small business in the right direction. 5. Small Business Marketing Network – A perfect group for anyone involved in small business marketing, this group helps you collect valuable information on how to boost your traffic and generate quality leads, how to enhance customer service and how to refrain from making some of the biggest marketing mistakes. 6. Small Biz Forum – One LinkedIn group that ensures valuable resources for small businesses, small biz forum is where small business leaders, experts and strategists work together to improve and point each others’ business in the right direction. 7. Small Business & Independent Consultant Network – An amazing LinkedIn group that endeavors to connect supreme talent with small businesses, this group allows members seeking services or resources to find appropriate talent or resources and also get knowledge about a wide range of topics. 8. Small Business Evolution | Entrepreneurs & SMEs – This group focuses on business-related discussions including leadership skills, workplace ethics, and the latest trends in the world of business. This LinkedIn group can help entrepreneurs get a better idea of how to successfully and efficiently operate and manage their small businesses. 9. Linked Small Business Innovators – This is yet another interesting LinkedIn group that entrepreneurs and small business owners must follow. This group offers information on a salmagundi of topics including industry news, latest business trends, tips and tricks, and useful resources. This group features some of the biggest names from the world of business and you can use this group to build relationships with influential people in the small business community. 10.Small Business Online Community – Small Business Online Community is yet another brilliant LinkedIn groups that empower people to point their small business in the right direction. In this group, you can find loads of information on small business operations, management, resources, etc. Did we miss out on any important LinkedIn groups for small businesses? Please share with us in the comments box below. Looking for Customized, On time, Social Media Page Design? Launch a Social Media Page Design Contest today. Choose from 100+ designs! Take your pick! Next Next post: Facebook Small Business Page: How to Get More Likes & Shares?